This last week has been insanely busy. At work we have had the American member of our team in Cape Town for the last two weeks which has been lovely. To take advantage of having the entire team on the same continent we have had meetings and that has meant that instead of working from home I’ve had to get dressed (in respectable clothes), put on make-up and go in to the office. In addition to going in to the office several times a week I’ve also been trying to get ready to leave for Australia. There’s a lot to do when you are going to be away for a month! I’ve made lots of lists and am slowly getting everything checked off. The major worry was finding a housesitter to look after the cat. I think we’ve found the perfect lady. She actually asked if we would mind if the cat slept on the bed. Fat Boy is going to be so spoiled when we get back. 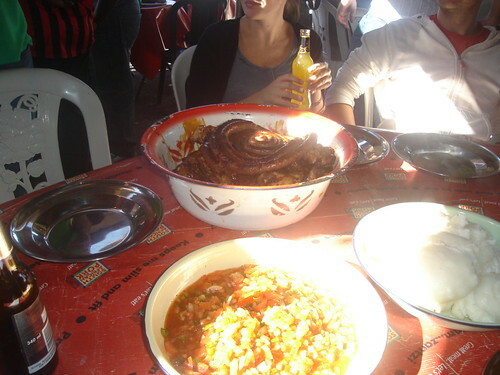 Last Sunday some of the guys from work organised a trip to Mzoli’s Meats for our American colleagues. This is somewhat of a Cape Town institution and it seems to attract a good mix of locals and tourists. 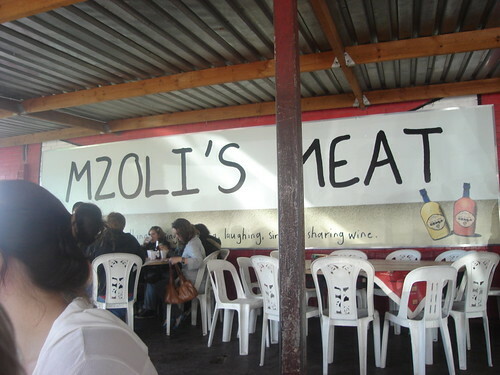 Mzoli’s Meats is located in the township of Gugulethu. Basically you go into the butchery and buy your meat. I didn’t get any pictures of that as I was trying to keep track of Gorgeous Girl who had been plucked from Gorgeous Man’s arms by a very lovely Xhosa grandmother and who was dancing her around the room. 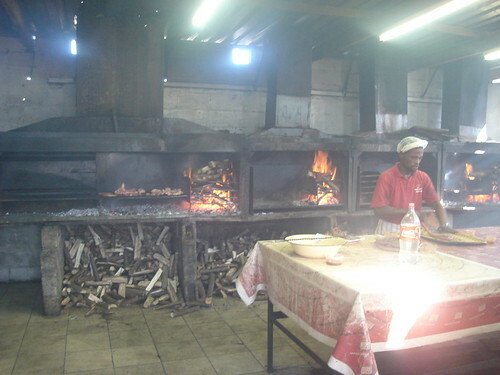 After you buy the meat (which is very cheaply priced) you get taken through to the smoke room where the meat will be cooked for you. Once the meat is cooked it is brought to your table and you eat it with spicy salsa and pap. Gorgeous Girl had a lovely time, but once the music started we were a little worried about the permanent damage we were doing to her hearing. It was so loud that it made me feel physically ill.
I’d definitely go back, but perhaps a little earlier in the day before the DJ does his thing. 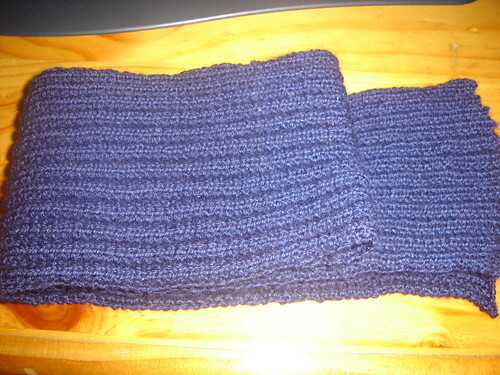 Scarf count is up to 51 with the arrival of two scarves from Rebecca and one from Hedgehog in my mail box. Unfortunately, life has been so crazy busy lately that I forgot to take a picture of their loveliness before delivering them. Thank you for the beautiful scarves! On Thursday we are heading to Australia for a month. Because we are flying to the West Coast (Perth) we only have 11 actual hours of flying. But the requirement that we be at Cape Town International two and a half hours before we fly and a two and a half lay over in Johannesberg beef out travelling time considerably. We are spending a week in Perth with my mum and then heading across to the East Coast to see the rest of the family. I’m not sure how often I’ll be able to blog while we are away. 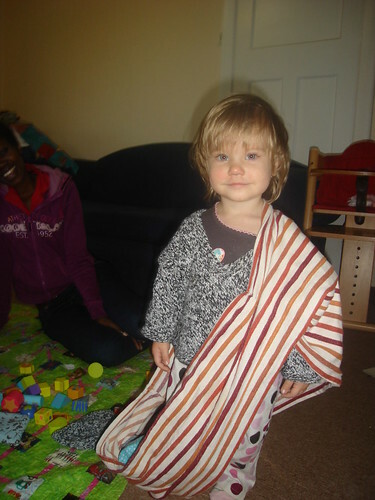 But will try and pop in with some pictures of Gorgeous Girl. My brother works in a wildlife park and Gorgeous Man’s father lives in a rural area and has kangaroos and wallabies in his front yard, so I’m sure there will be at least one picture of Gorgeous Girl with some native Australian fauna. On Monday I met with Christina for coffee and to pick up a scarf. During the course of the conversation she mentioned a local op-shop (thrift shop) that often had knitting supplies (she found a ball winder there!). So, since it was close by we decided to take a walk and have a look. Closer inspection shows that not all the needles in two of the sets are the same size but they will augment sets I already have. Look at the shiny pink ones, not sure what the cream ones are made from. 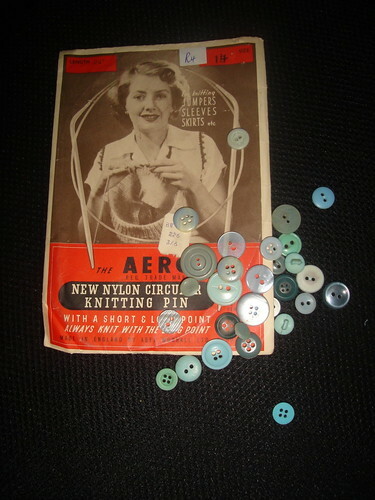 I bought the circular needle just for the old packaging, and the buttons cost me one Rand. You can’t buy anything for a rand (for comparison a loaf of bread will cost you about 7 or 8 Rand). 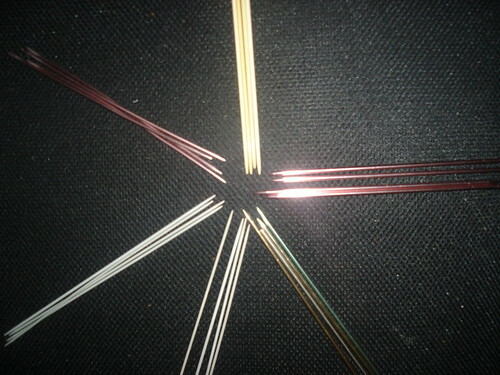 So what’s a girl to do when she has a whole bunch of new needles and her needle holder is full? 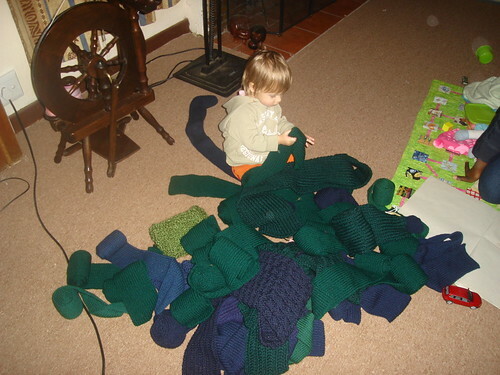 Make a new one of course. The inside. 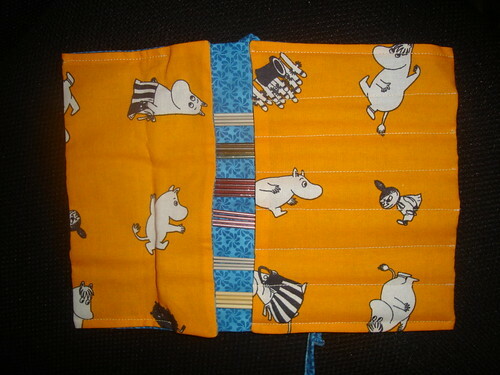 The orange fabric came from the fabulous Syko. 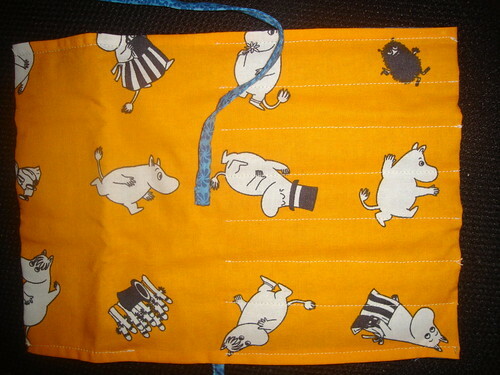 She included it in the package when I won a prize on her blog last year. I’ve been saving it for special. Apart from trimming it straight, I used every inch. The blue fabric is part of the haul that Gorgeous Man brought back from Canada last year. A true international piece! 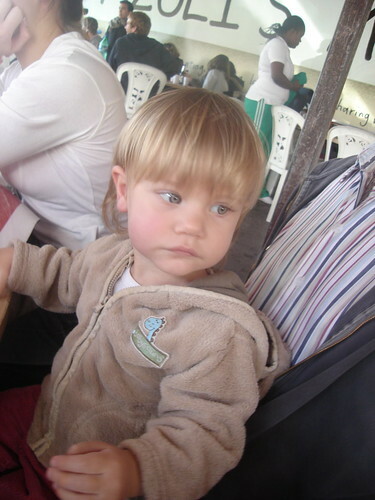 Finally, some totally gratuitious pictures of Gorgeous Girl. 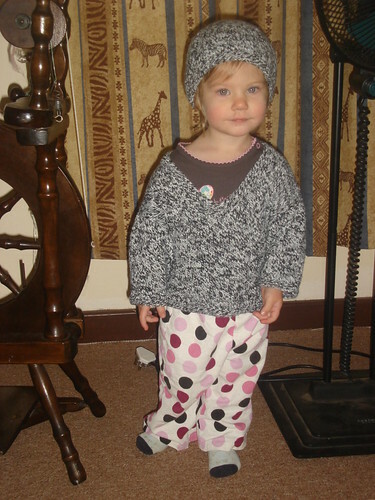 Here she is in a hat and jumper I made.